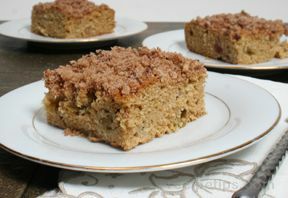 The moist texture and crunchy topping are a perfect combination for this flavorful rhubarb cake. Search our site for many more delicious rhubarb recipes. Learn how to freeze rhubarb so that you can enjoy all your favorite rhubarb recipes all throughout the year. Mix the white sugar, nuts, cinnamon, and melted margarine together. Set mixture aside to use later. Grease and flour a 9" x 13" x 2" cake pan. Preheat the oven to 350° F.
In a large mixing bowl, beat the shortening, margarine, brown sugar, and egg together with an electric mixer until light and creamy. Add the rhubarb and stir until well distributed. Pour batter into the cake pan and spread evenly. Sprinkle the topping evenly over the top of the cake. Place in the preheated oven and bake for 45 minutes or until a toothpick poked in the middle of the cake comes out clean.